August 10, 2014 President of the International Union of Muslim Scholars Dr Youssef al-Qaradawi has denied remarks attributed to him in which he allegedly downplayed the importance of armed struggle against the occupation in Palestine. A statement by the Muslim scholar on Saturday said that a number of ‘dubious’ media outlets, which he did not name, publicised ‘baseless’ remarks attributed to him, and capitalised on them to denigrate him as part of a smear campaign aimed at misrepresenting his positions on the Arab Spring and Palestinian resistance. The IUMS, led by Qaradawi, has issued a number of statements since the start of the Israeli offensive on Gaza on July 7, and called for staging protests every Friday in solidarity with the Palestinians. The GMBDW reported last week that two websites associated with the Union of Good (UOG), the Hamas fund-raising networked headed by Qaradawi, have gone dark and no longer host any form of site. In addition, the IUMS website appears to have been hacked and has not come back online. Aside from the IUMS statement, Qaradawi has been uncharacteristically silent during the Gaza conflict. Youssef Qaradawi is the most important leader of the Global Muslim Brotherhood and is the de facto spiritual leader of the movement. 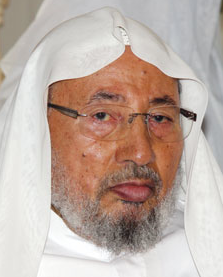 For a profile on Qaradawi, go here.